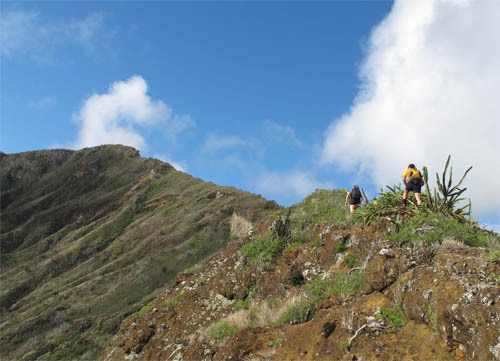 We climbed up the Arch at Koko Crater, scrambled around the circumference of the rim to the crater summit, and descended to the foot of the cone along the ocean to loop back where we started. One of the cool things about Kohelepelepe or Koko Crater is that one side of the crater collapsed creating an opening in the bowl. Justin Ohara, Thea Ferentinos, John Braum and I dropped down into the opening and climbed up to regain the crater rim before continuing on to the summit. 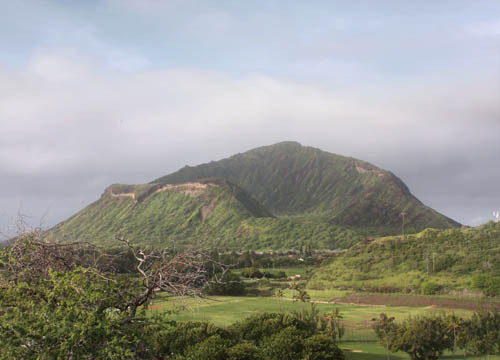 This photo — taken on January 1, 2009 — shows the opening in the north side of Koko Crater covered with green vegetation. Today, exactly 3 years later on January 1, 2012, the landscape is much drier. This winter has been dry so far. The rainy season — hoʻolio — has not yet arrived in many places. 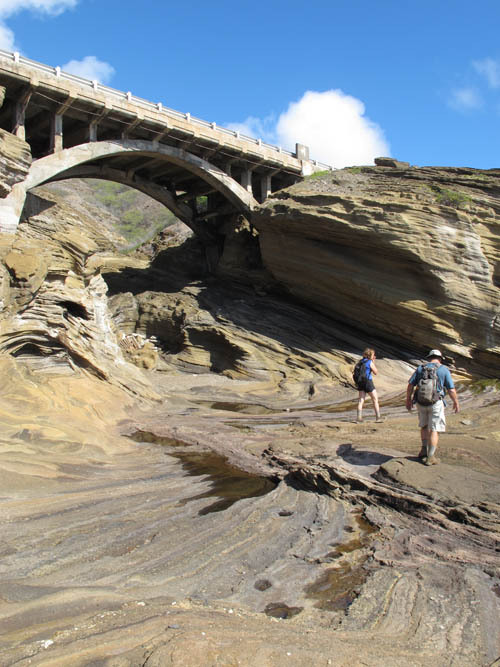 Pushing off from Blowhole, we made our way up the parched ridge at Halona Point to the arch. Koko Cater is made from layer upon layer of volcanic tuff with different erosional properties. Ridges on the crater have dark layers more resistent to erosion than the beige layers beneath it. When soft biege rock erodes completely away under a strong dark layer, arches are created. 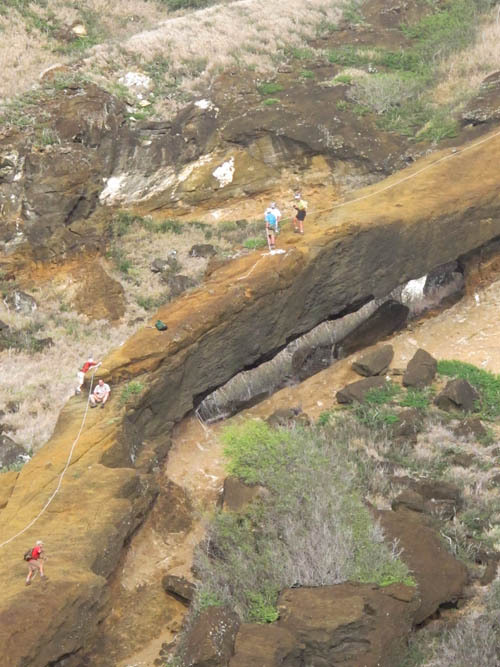 While making our approach to the Arch at Koko Crater we could see the remnants of an older arch that collapsed on the adjacent ridge. The arch is oriented at about a 30 degree incline. Straps and webbing assist hikers climb over the arch. It is always exhilarating to climb up the arch imagining the gaping hole beneath you as you cross to the other side. 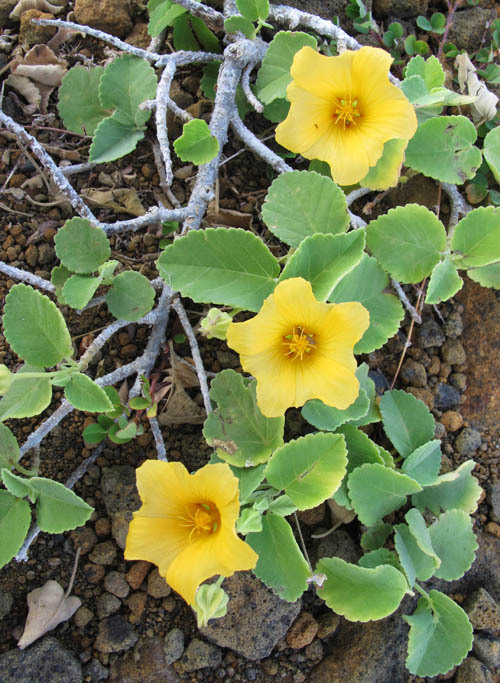 After crossing the arch, we continued up to the crater rim where we saw the yellow-orange flowers of ʻilima papa (Sida fallax) crawling prostrate on the ground. 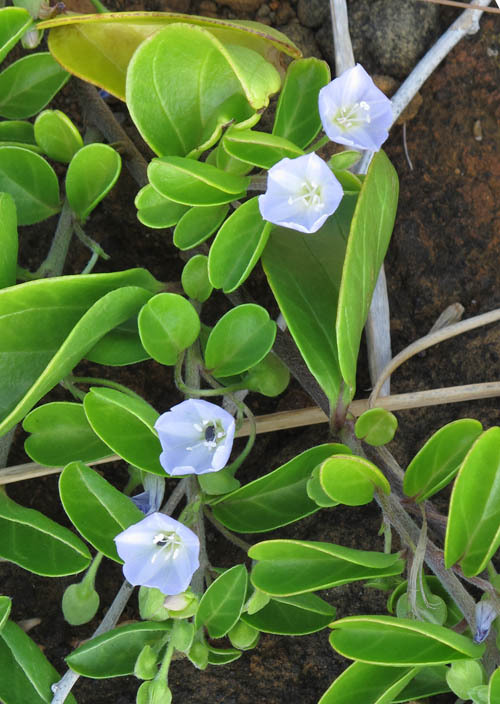 We also saw the light blue-purple flowers flowers of paʻu-o-hiʻiaka (Jaquemontia ovalifolia sandwicense) on long vine like runners that sprawled up and over the landscape. 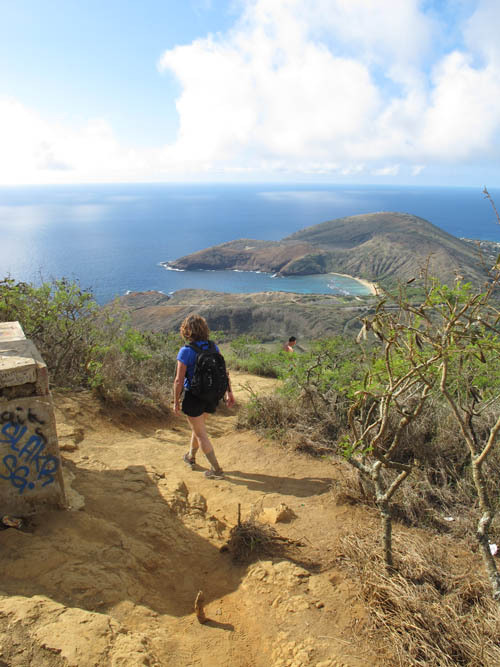 When we reached the rim of Koko Crater, we rested for a bit to admire the blue ocean and the arid landscape at Hanauma Bay and Koko Head — the eastern most tip of the island. 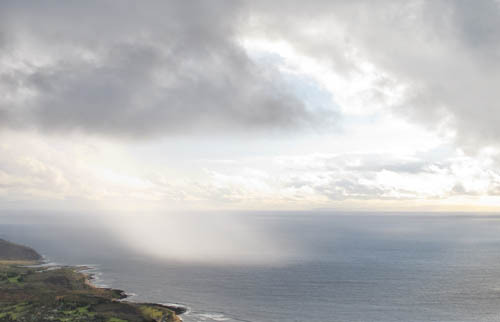 While hiking northwards towards the opening, we admired the view of Molokai way off on the horizon and watched a small rain squall blow in from the Ka ʻIwi channel. The squall approached quickly and passed right in front of us. We felt a few sprinkles but the main part of the cloud passed right by much to the disappointment of the parch landscape. We continued along the crater rim unscathed. Blue skies returned as we continued in the counter clockwise direction. 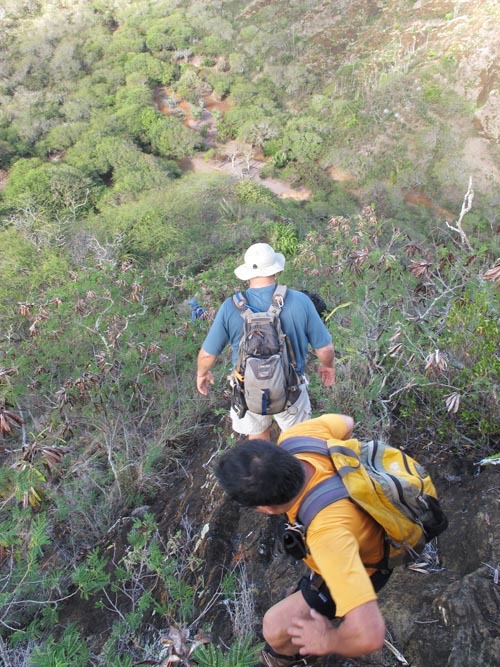 The rim overlooking Sandy Beach is broad and easy to hike so we made quick time reaching the opening in the crater wall. When I looked on the other side of the crater, I could see the beginnings of an arch. Just like the arch we crossed, the beige colored rock beneath the darker rock is eroding away and will eventually form a hole leaving an arch spaning the empty space. When we reached the opening in the crater wall, we dropped down to the floor of the crater. 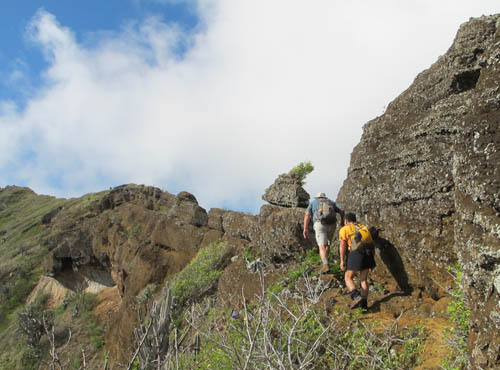 We then climbed up on the other side of the gap to continue our counter clockwise circuit of the crater rim. The rim became narrower the higher we got. At a few spots the rim whittled down to under a foot wide with steep drop-offs on either side where you have to scramble up a rocky outcrop. A fall at any of these spots would be bad news. When I crossed this narrow section before, the wind blew hard and made the traverse unnerving. But there was little wind today and the crossover was a breeze. We continued along the rim to where we overlooked the marina where a number of rocky up-swells must be scrambled up to reach the highest point on the rim. 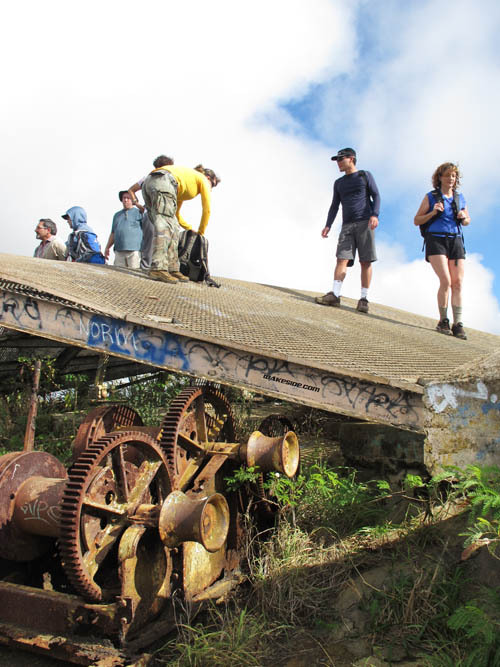 Puʻu Mai — the highest point on Koko Crater at 1,208 feet elevation — was where a World War II radar installation once stood. 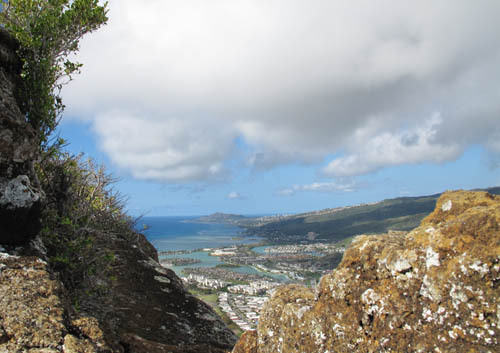 We relaxed at the top to admire awesome views of the Ka ʻIwi Coast and the south east coast of Oʻahu. 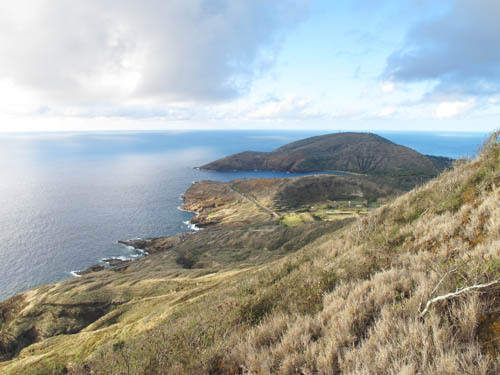 We admired the view of Hamauma Bay as we descended to the foot of the crater. 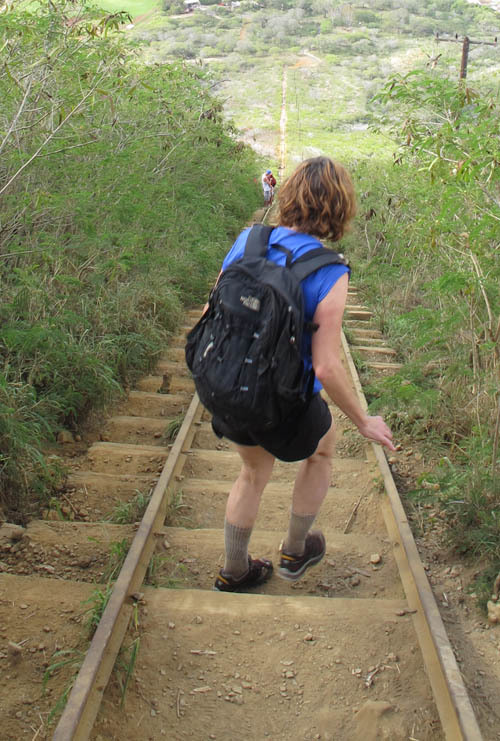 We dropped down the tracks that were used to transport supplies to the summit and made our way through the rifle range at the base of the crater. 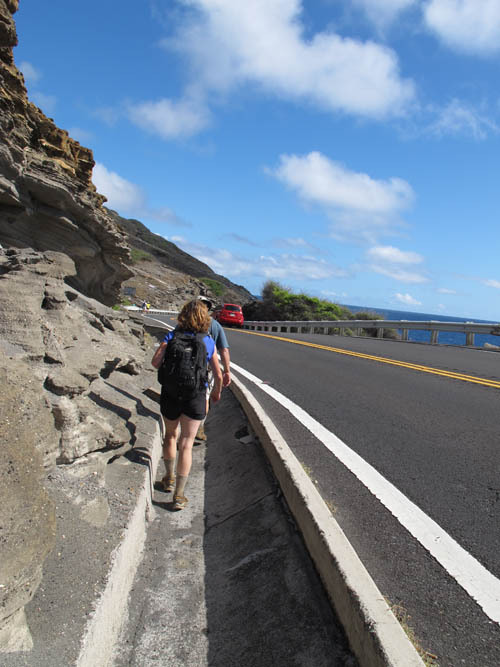 When we reached the highway, we hiked along the side of the road to a gully beyond the Lanai Lookout. 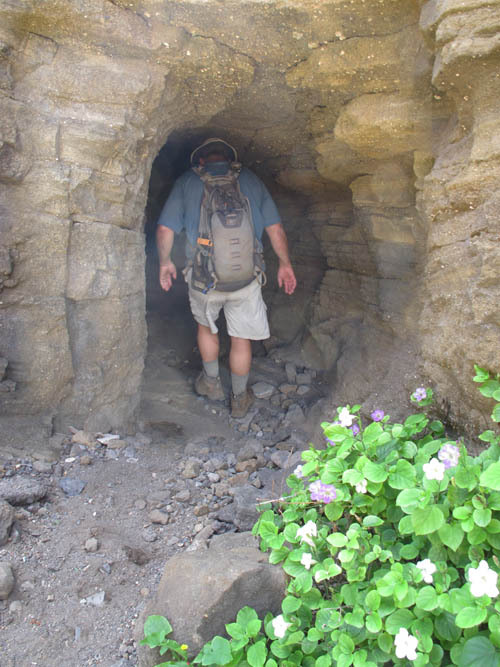 When we reached the gully, we took the tunnel beneath the highway to reach the shelf at the foot of the crater along the edge of the ocean. 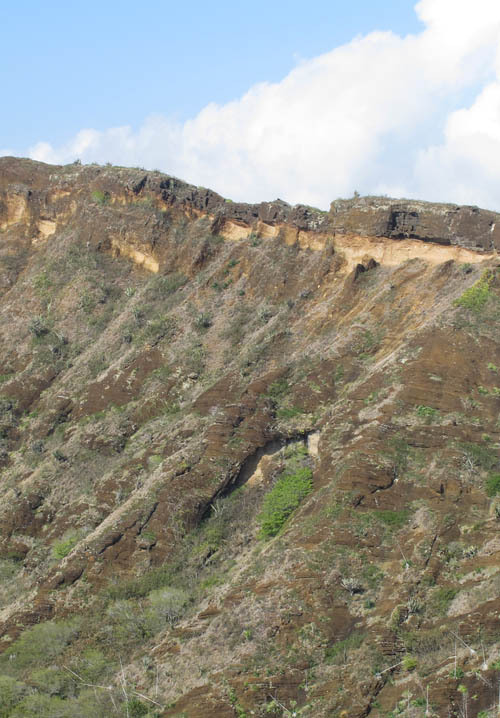 While making our way along the coast, we saw the many layers of volcanic tuff that comprise Koko Crater. We were lucky that there was little wind which allowed us to see through the surface of the water. 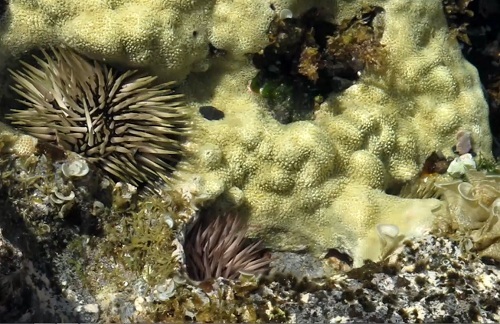 We saw lobed coral at the bottom of the tide pool along with ʻina or rock boring urchins which carve living chambers in the rock. 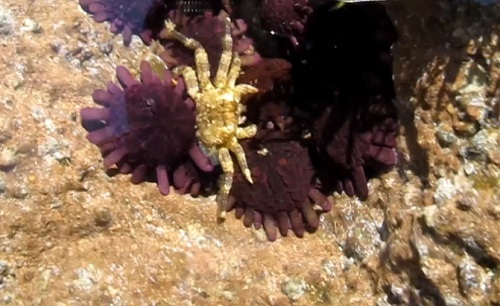 We also saw a crab among the purple haʻukeʻuke or shingle urchins whose spines have to flatten out to form armored plates that withstand the full impact of the waves. 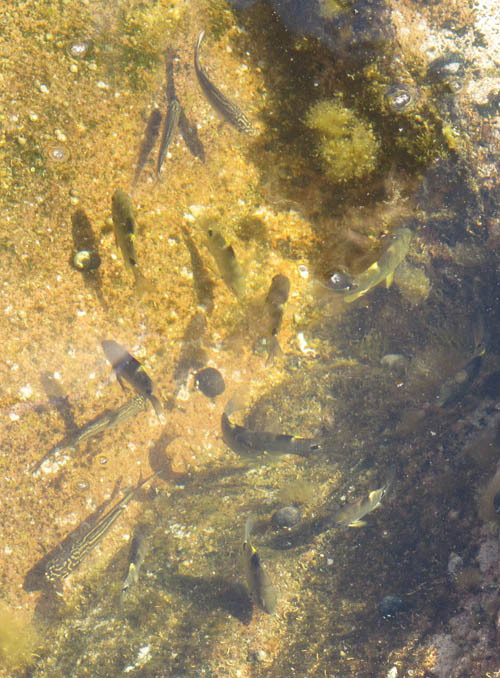 The tide pools teemed with life — we saw many aholehole, mamo, and many other small fishes in the pools. 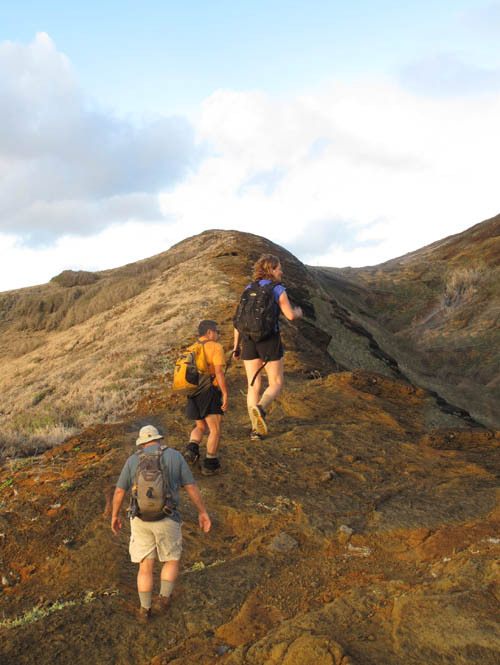 When we reached Halona Point, we climbed up the craggy rocks and walked along the highway which gave us a commanding view of Halona Cove and the Ka ʻIwi coastline. 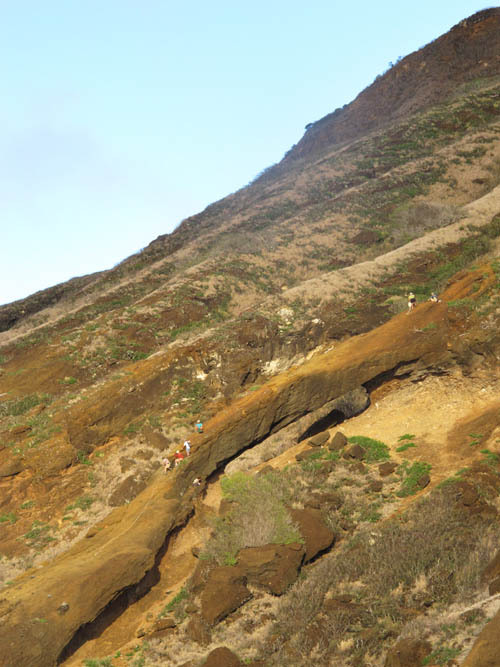 While making our way back to Blowhole where we started, I reflected on the great variety of things we did climbing up the Koko Crater Arch, scrambling along the rim of the crater, and seeing the tide pools at the very base of the crater along the ocean. What a great hike! Personal communication with Dave Fahrenwald concerning World Ware radar installation at the summit of the crater. Great hike! 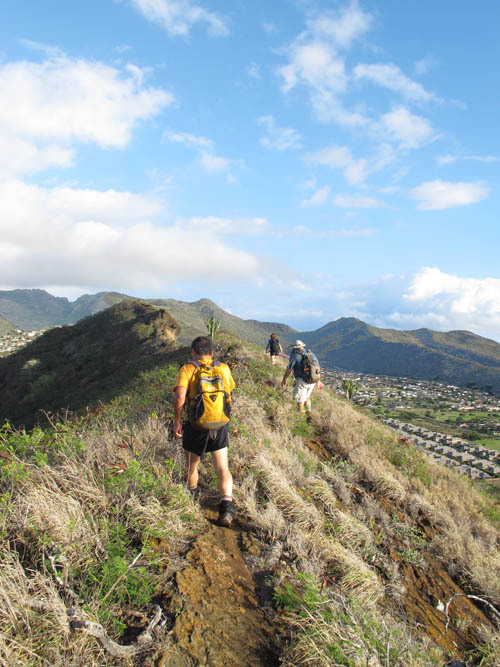 Maybe the HTMC new years day hike can be augmented to this. Am I mistaken or is not Makapuu Head the easternmost point of Oahu? 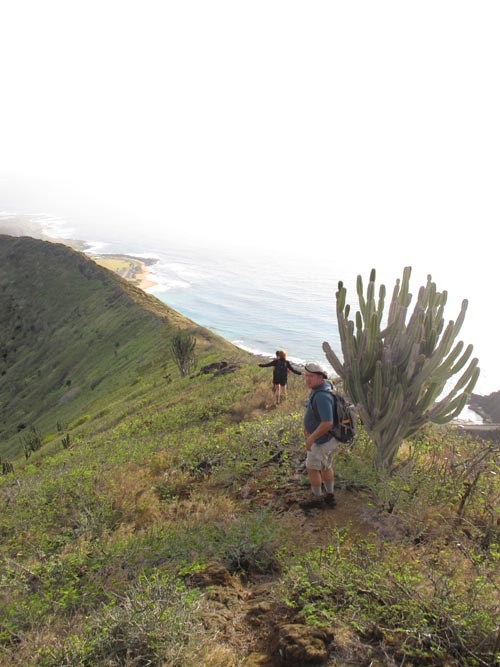 What a thorough blog about Koko Crater. 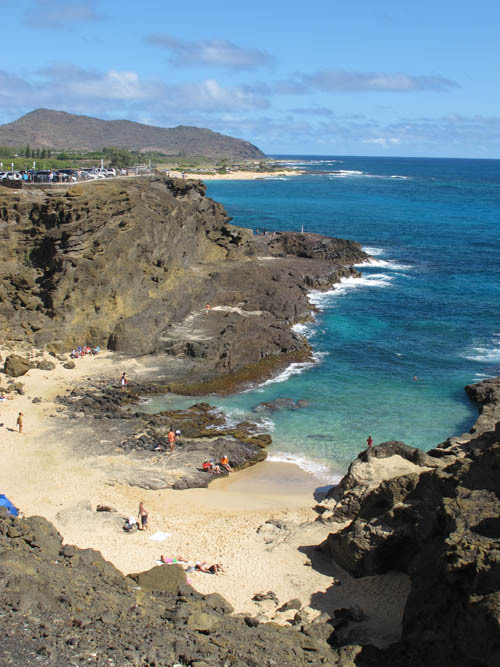 I’ve already left Hawaii, but I plan to come back next year in 2013, and due to your excellent commentary and photographs of this amazing location, I intend to hike there. Mahalo!! !